The WPI Spotlight showcases the best analysis recently written by our analysts. We've chosen to share these articles so you can see how we approach market and policy analysis and see the value for yourself. Enjoy reading this collection of "best of" articles and feel free to contact us with any questions. Subscribe now for full access to our "best in class" analysis. For corporate subscription pricing, please contact us. 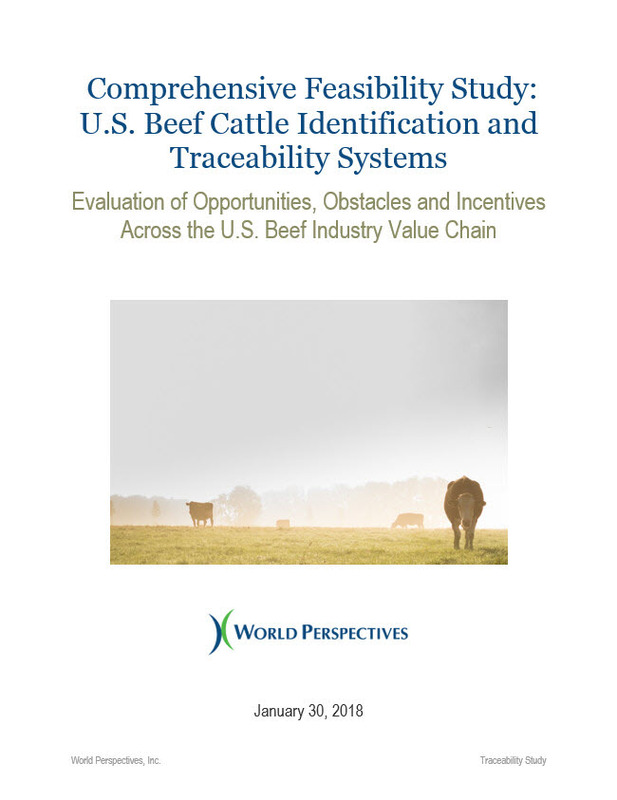 In response to the 2016-2020 Beef Industry Long Range Plan’s key strategic objective, “Secure the broad adoption of individual animal ID traceability system(s) across the beef community to equip the industry to effectively manage a disease outbreak while enhancing both domestic and global trust in U.S. beef and ensuring greater access to export markets,” WPI researched and wrote the industry’s most foundational analytical document on animal identification and traceability. The report offers a series of conclusions based on, among other methodologies, a 600-plus respondent quantitative survey, 90-plus interviews with industry participants from all sectors), and a deep-dive review of 9 global systems supported by direct interviews with foreign industry association and government officials. Since the report’s initial rollout at the 2018 NCBA Convention in Phoenix, AZ, WPI has presented findings to and led constructive discussion with over 30 audiences of stakeholders from across the industry and beyond. 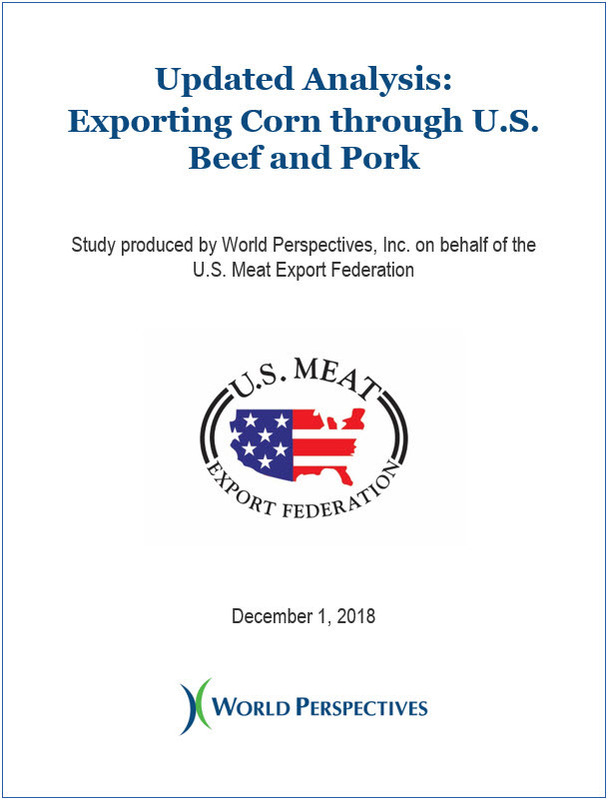 On behalf of the U.S. Meat Export Federation (USMEF), in 2018 WPI delivered the results of an updated study aimed at quantifying the value red meat exports deliver to U.S. corn producers. The original 2016 study, as well as the 2018 follow-up, also quantified the impact that red meat exports have on select corn co-products such as distiller’s dried grains with solubles (DDGS). The updated 2018 study concluded that 2018 beef and pork exports will use a combined total of 14.9 million tons of corn and DDGS, which equates to an additional 459.7 million bushels of corn produced – an increase of 29 percent over the 2015 projections. This article originally appeared in the 3 April 2019 issue of Ag Perspectives. China’s national average live pig price climbed 3.5 percent from the previous week to reach RMB 14.97/kg ($2.24/kg) or RMB 6.79/lb. ($1.02/lb.) as of 20 March, its highest level since January of last year. This strong momentum marked three straight weeks of solid increases since the end of February. At this pricing, demand for imported pork products should continue to rise for the balance of 2019. The latest USDA-FAS semi-annual livestock and products report forecasts China’s pork imports will grow 33 percent this year to 2 MMT. The situation may seem to offer little consolation for U.S. producers, given they face a 62 percent retaliatory tariff in China versus 12 percent most-favored-nation rate for competing countries. Despite this tariff, however, the U.S. average price of pork and pork product exports to China are quite competitive. This past January, pork shipments to China totaled 18,823.1 MT with an export value of $41.02 million versus 20,909.9 MT valued at $50.98 million for the same month last year. The average export price was $0.99/lb. compared with $1.11/lb. in January 2018. From the end of January through mid-March, 43,460 MT in additional new export sales of fresh, chilled or frozen pork meat cuts were booked. 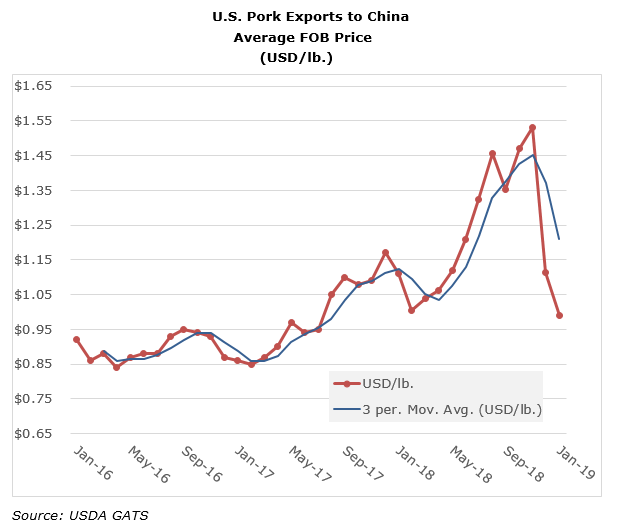 The other potential beneficiary of the African swine fever (ASF) outbreak and sharp contraction of China’s swine inventory, which USDA expects to fall to 374 million head by the end of 2019, is beef exports. While beef demand is growing in China, USDA estimates the domestic cattle herd has dropped to 91 million head thus far in 2019 (the number is derived from China’s domestic industry figures), down 3 percent from 2018. At the same time, China’s central government has worked to diversify its sources of imported beef. Those imports are expected to reach 1.6 MMT in 2019, up 20 percent from 2018. Since regaining market access in June 2017, U.S. beef exports to China have been steady. For all of 2018, they totaled 7,297.9 MT with an export value of $60.77 million for an average price of $3.78/lb. This past January, the total was 818 MT worth $6.31 million versus 819.6 MT valued at $7.52 million for January 2018. While China’s national live hog price has experienced solid growth through the end of March, the uptick has not translated into higher feed demand. 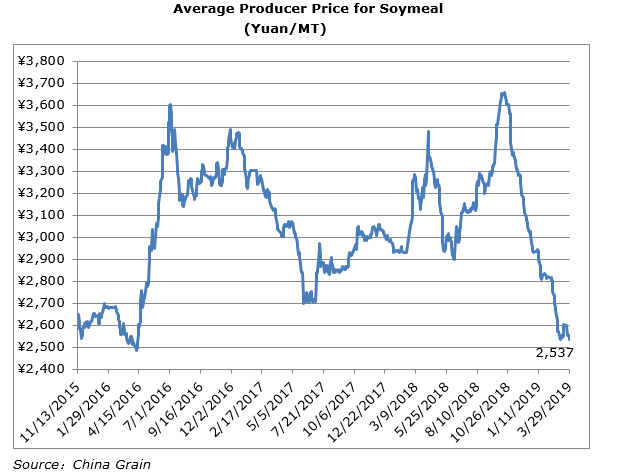 Market speculation that the poultry, cattle, and aquaculture sectors will eventually offset the decline in feed demand from hog producers, a view also indicated in the recent annual report on China’s oilseeds and products from the USDA FAS Beijing post, has yet to materialize. As a result, China’s estimated soymeal inventory was up a modest 9,100 MT (+1.5 percent) from the previous week at 632,200 MMT as of 29 March 2019 but 141,500 MT (-18.3 percent) lower than the final week of March 2018. Regionally, meal inventories rose in four regions and fell in three. The largest weekly gain in relative terms was an increase of 11,500 MT (+25.6 percent) to 56,500 MT in Guangdong, and the biggest decrease of 23,200 MT (-42.6 percent) to 31,300 MT occurred in Shandong. Data from China Customs shows that soybean imports from October 2018 through February 2019 totaled just 29.9 MMT, down 8.1 percent from 38 MMT during the same period one year prior. While reports in February noted that China had made an offer to buy an additional 10 MMT of soybeans from the U.S., those figures have not yet appeared in weekly U.S. exports to China. The total official commitments for MY 2018/19, which began on 6 September 2018, totaled just 11.22 MMT as of 21 March 2019, 40 percent less than a year ago. Over the same period, accumulated exports reached a paltry 4.68 MMT compared with 25.9 MMT a year ago. Meanwhile, soybean imports from Brazil, which began arriving earlier in 2019 than in previous years, have not filled the void. Harvesting of the Brazilian crop was 68 percent complete through the last week of March, 4 percent higher than the five-year average at that point in the season. However, regional news there reports that farmers are continuing to experience quality problems due to variable weather, which includes very dry conditions in the south and very wet conditions in the north. 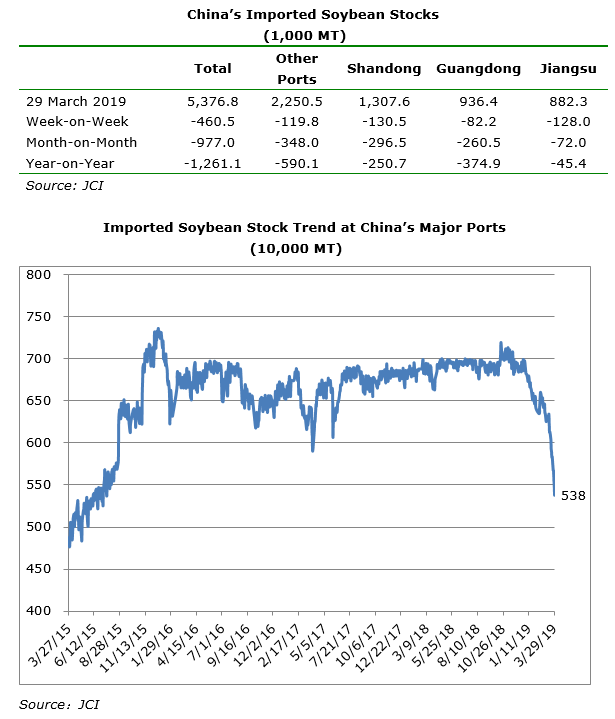 As of 29 March, China’s estimated imported soybean stocks at its 20 major seaports showed their largest weekly decrease in the past few years, falling 460,500 MT (-7.9 percent) to 5.38 MMT. This marks their lowest level since the end of June 2015. There were weekly declines across all regions with the largest occurring at the ports in Shandong and Jiangsu with drops of 130,500 MT (-9.1 percent) to 1.31 MMT (24.3 percent of the national total) and 128,000 MT (-12.7 percent) to 882,300 MT, respectively. Declines in the imported costs of U.S. and Brazilian soybeans did little to help crushers last week as wholesale prices for soymeal and soyoil continued to fall. The average CNF price for imported U.S. soybeans dropped $7/MT to $387/MT last week, while that for Brazilian soybeans ticked down $10/MT to $373/MT. On the product side, the average producer’s price for soymeal decreased RMB 63/MT to RMB 2,537/MT ($377/MT). Meanwhile, the producer’s price for soyoil fell sharply, dropping RMB 141/MT ($21/MT) to RMB 5,379/MT ($799.3/MT). 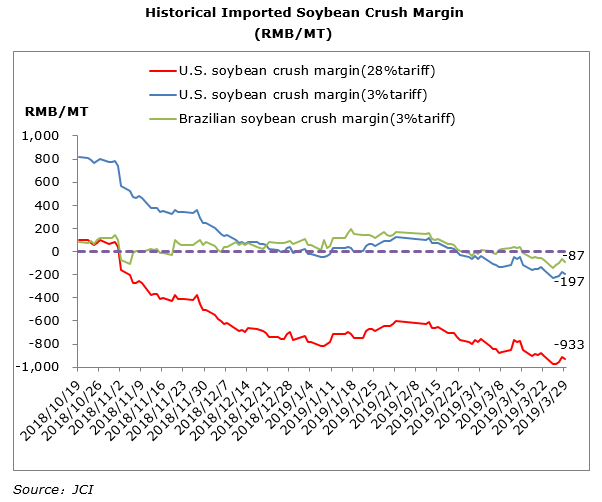 The net result was a widening of the estimated nominal operating loss on U.S. soybeans by RMB 30/MT ($4.50/MT) to RMB 933/MT ($138.60/MT), while the average crush margin on Brazilian soybeans continued to decline further into the red as the estimated loss expanded by RMB 15/MT ($2.20/MT) to a negative RMB 87/MT ($12.90/MT). 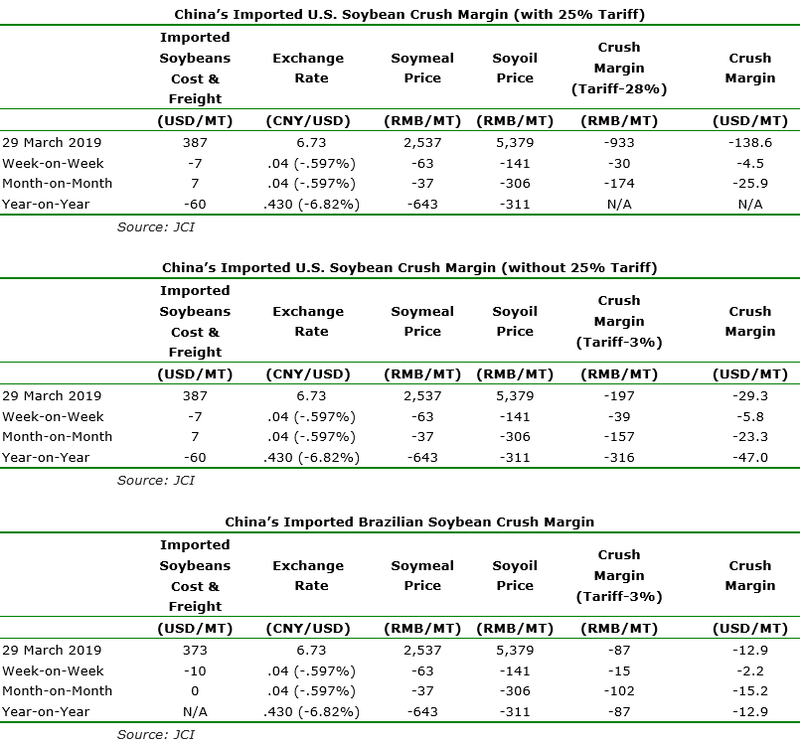 In looking at the margin on U.S. soybeans without the 25 percent retaliatory tariff, the operating loss continued to expand with an increase of RMB 39/MT ($5.79/MT) to a negative RMB 197/MT ($29.27/MT). This means U.S. prices will have to decrease in order to be competitive with Brazil once a trade deal is reached. 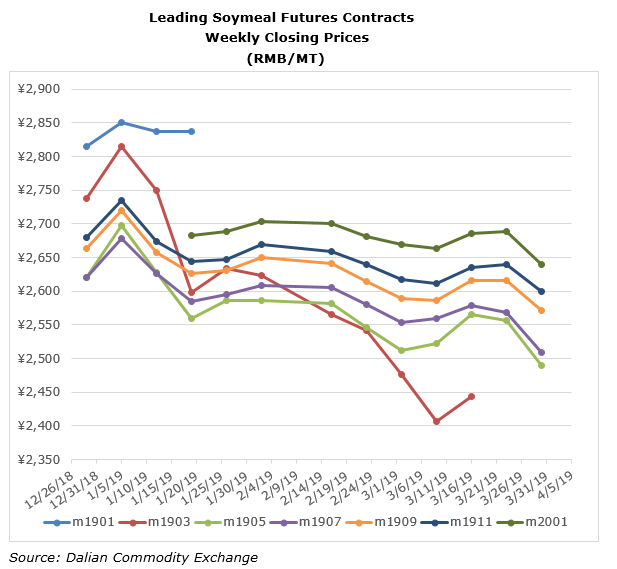 The most heavily-traded soymeal contract on the Dalian Commodities Exchange, the May contract (m1905), shed RMB 59 ($8.77/MT) to close at RMB 2,489/MT ($369.84/MT). The next most significant contract, the September contract (m1909), was down RMB 38/MT ($5.65/MT) at RMB 2,572/MT($382.17/MT). To put these figures into perspective, last year’s May contract (m1805) ended March 2018 at RMB 3,149/MT ($467.90/MT), and the 2018 September contract (m1809) closed that same month at RMB 3,158/MT ($469.24/MT). 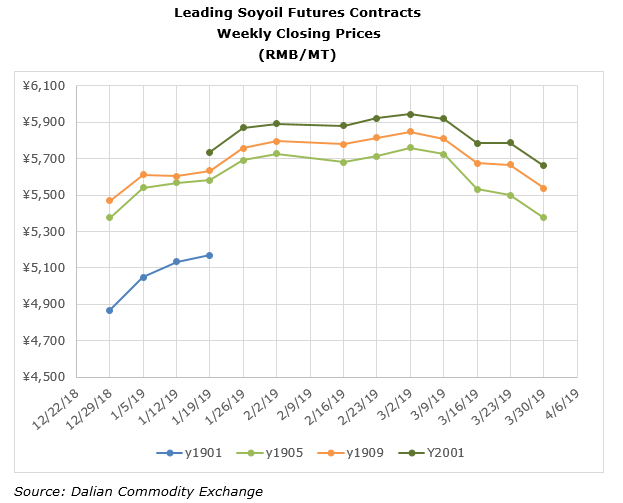 As for soyoil, this year’s May contract (y1905) finished the last week of March down RMB 130/MT ($19.32/MT), while the September contract (y1909) closed down RMB 138/MT ($20.51/MT) at RMB 5,536/MT ($822.59/MT). A combination of uncertainties regarding feed demand due to the lasting impacts of ASF and the possibility of a resolution to the trade conflict with the U.S. unnerved China’s domestic industry last week. 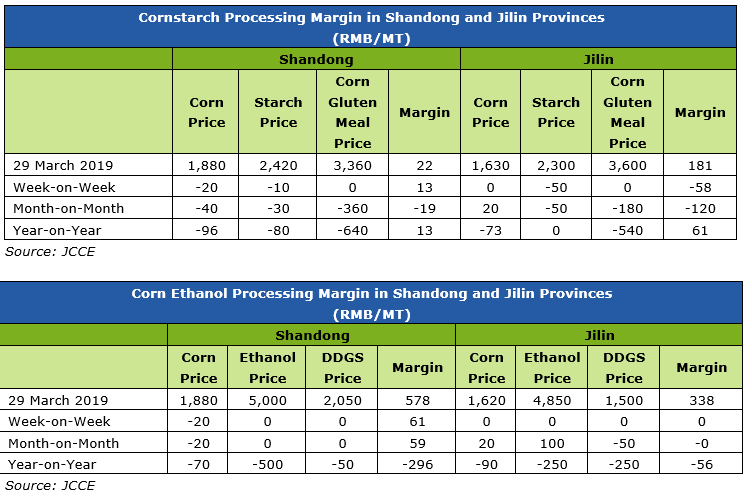 The average corn prices in Guangdong and Shandong Provinces both decreased significantly, falling RMB 17/MT ($2.53/MT) to RMB 1,870/MT ($277.90/MT) and RMB 23/MT ($3.40/MT) to RMB 1,875/MT ($278.60/MT), respectively. 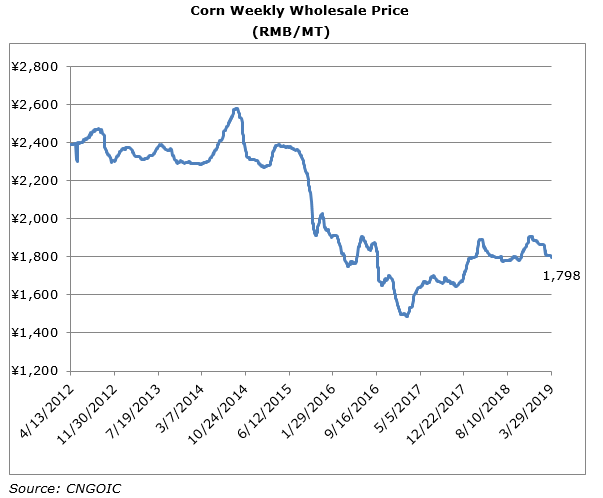 These week-on-week declines drove the national average corn price down RMB 10/MT ($1.50/MT) to RMB 1,798/ MT ($267.20/MT). On the processing side, the downward trend in corn gluten meal stopped last week as prices held steady, but the average cornstarch prices in Shandong and Jilin dropped RMB 10/MT ($1.50/MT) to RMB 2,420/MT ($359.60/MT), and RMB 50/MT ($7.43/MT) to RMB 2,300/MT ($341.80/MT), respectively. In contrast, the average prices for ethanol and DDGS held steady. 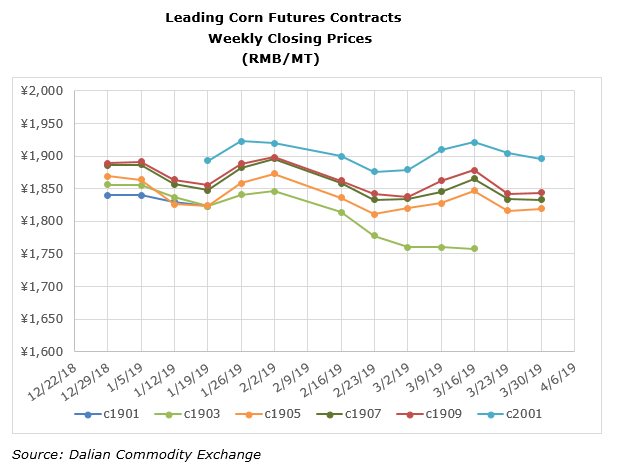 The two most heavily-traded contracts on the Dalian Exchange for corn were relatively flat the last week of March. The May contract (c1905) closed out the month at RMB 1,819/MT ($270.28/MT), up RMB 4/MT ($0.59/MT) from the week prior, and the September contract (c1909) was unchanged from the previous week at RMB 1,844/MT ($274/MT). In contrast to soymeal, corn’s May contract was up RMB 35/MT ($5.20/MT) versus the end of March 2018, while the September contract was RMB 100/MT ($14.86/MT) higher. 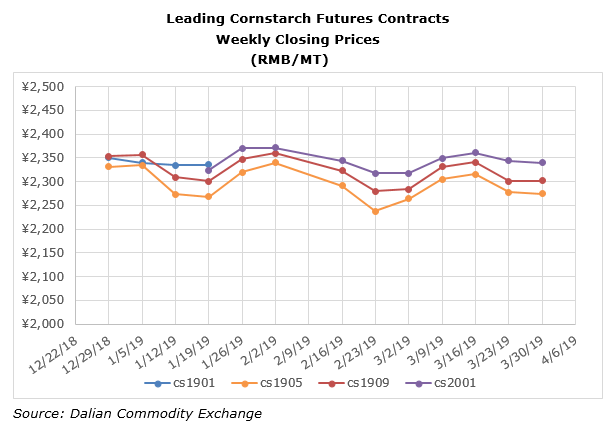 The two leading contracts for cornstarch closed out March with modest decreases. The May contract (cs1905) was the most heavily traded and finished at RMB 2,275/MT ($338.04/MT), down RMB 7/MT ($1.04/MT) from the week prior. Finally, the September contract (cs1909) ended March at RMB 2,302/MT ($342.05/MT), down RMB 3/MT ($.45/MT) from the previous week. As with corn, cornstarch futures are higher than in 2018, which points to the market consensus that whatever old corn remains in China’s strategic reserve likely has limited commercial value. This article originally appeared in the 2 April 2019 issue of Ag Perspectives. During the 2016 campaign, candidate Donald Trump manufactured many fake issues such as illegal immigrants causing a crime wave and NAFTA being the worst deal ever. His mainstream opponents avoided such hyperbole, and Trump won. Now the Democratic Party candidates are all trying the fake issue approach as they espouse a largely false narrative about the nation’s agricultural sector. Like Trump, if they win and pursue some of their campaign promises, it will be more harmful than helpful. At this past weekend’s campaign event in Storm Lake, Iowa, the candidates lamented the concentration in agribusiness and blamed it for farmers not getting a “fair deal.” They want a moratorium on mergers and to break up Big Ag, citing Bayer-Monsanto as an evil example. Consolidation was blamed for everything from the farmers’ low share of the food dollar to stagnant wages, higher prices, lower product quality, etc. Big Ag is being hurt by the bear market in commodities and competition, just like the smaller farmers who dominate the Democratic campaign events. Again, to cite the Journal, big food companies “are losing market share to entrepreneur-led food brands,” and ingredient companies’ “[s]ales to startup brands are increasing at two to three times the rate of those to global clients.” It should be noted that prices are rising because of the higher wages being paid to attract workers in a tight labor force. Much as the Obama administration discovered when it ventured into this tortured debate, Big Ag is not as profitable as populists contend. Publicly-traded shares in companies like Tysons, JBS and Bunge have all been declining. Bayer’s stock has fallen in half since its acquisition of Monsanto, and DowDupont is splitting itself into three separate companies to hopefully find profitability. The earnings per share by Big Ag are swamped by those in sexier sectors. In fact, one of the most profitable industries is legal services, a category that populates most of the political offices in the country. One of the more notable comments from Storm Lake was made by the town’s newspaper editor, Art Cullen, via a Washington Post article. He said that audience members and moderators offered the candidates “openings to talk about trade…But none took the bait.” That is because the audience was filled with farmers belonging to small organizations like R-CALF and the National Farmers Union, which belong to the Coalition for a Prosperous America (CPA). The latter not only supports the Trump trade wars, it is backing legislation to give the current president even more unilateral tariff authority. Democrats are not rising above Donald Trump. They are instead doubling down on his approach of ramping up fake issues and then proclaiming to be the savior. It is the kind of deceptive marketing that agribusiness could only dream of getting away with. President Trump’s reelection depends on a strong economy, one that is already weakened by trade wars. Exercising his threat to withdraw from NAFTA would only worsen the situation. This means Section 232 tariffs stay on as do retaliatory tariffs on U.S. agriculture by Canada and Mexico. EU and UK: Trump trade policy threatens car tariffs to extract a comprehensive trade agreement with the EU, but Brussels can’t politically build the negotiating mandate due to opposition to Mr. Trump. Europeans say no to agriculture and want to impose high environmental conditions. The fallback is a free trade agreement (FTA) with the UK, but now some congressional Democrats say the FTA must first be with the EU. Thus, the talks are stranded with Section 232 tariffs still imposed along with retaliatory tariffs against U.S. agriculture. Japan: The Trump administration conceded to Japan that trade negotiations would be staged with industrial goods first and then agriculture. However, now to placate American agriculture, there may be a push by the White House to reverse the order. It is unclear that Tokyo can politically concede on this point, but look to congressional Democrats to once again seek to foil any productive outcome. Result: the talks are stranded, and more time will pass with U.S. agriculture at a disadvantage in the Japanese market to food suppliers from the CPTPP countries. Democrats may not be able to get more votes from U.S. farmers in 2020, but they may be successfully plotting a way to at least get them to stay home.